Several salt farms in the Democratic People’s Republic of Korea (DPRK) will trial new brine management and salt harvesting practices in an effort to produce enough iodized salt to meet the population’s iodine nutrition needs. Under the new method, salt will be piled in stacks to dry alongside the salt pans, instead of dried in a factory, in order to produce higher quality raw salt, and to iodize it directly in the salt pan. This is the latest strategy to increase production of iodized salt in DPRK, to address identified iodine deficiency. 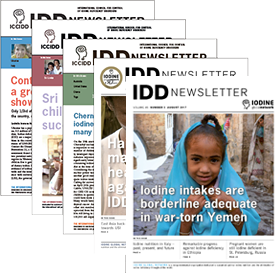 When iodine status was last assessed, in 2010, all except two of the eight provinces were found to have sub-optimal iodine intake on the basis of urinary iodine levels, leaving the population vulnerable to iodine deficiency disorders (IDD), the leading cause of preventable brain damage in newborns. Salt production in DPRK has long been aimed at producing salt in quantity and at speed, primarily for industrial uses. Currently, raw salt in DPRK is harvested multiple times during the harvest season, and a small proportion of this is washed, dried, and iodized in the factory for human consumption. While this approach may produce raw salt quickly, it does not produce good quality raw salt, and has not proved conducive to effective iodization. Salt in DPRK is produced primarily through open-pan solar evaporation of brine collected from seawater, and is relatively low-purity (86% sodium chloride) and unusually high-moisture (12%). It therefore has to be washed and dried before iodization, leading to extensive losses in volume. In the past, the raw salt has been dried in factories using centrifuges, which is costly and energy demanding. More so because of power supply constraints in DPRK that often cause the centrifuges to run at half capacity. Under the new strategy, higher quality raw salt will be produced that does not need to be washed and dried, and which can be iodized directly in the pan, cutting costs and streamlining the production process. DPRK’s leadership hopes to supply enough iodized salt to provide 4.5 g of iodized salt per person per day for direct consumption, in addition to raw salt for other household uses, including production of kimchi, a staple in Korean cuisine. These important decisions were reached during a visit in November 2017 by IGN to DPRK, in close collaboration with UNICEF and other national stakeholders. Despite considerable investment in salt iodization in past years, in 2014 only half the targeted amount of iodized salt was produced, and in 2010 less than a quarter of households were receiving adequately iodized salt. These low levels of coverage were in spite of extensive equipment and technical support from UNICEF, including the provision of KIO3 (the chemical form of iodine added to salt), iodization machines, packaging materials and fuel, centrifuges for drying the washed salt, and salt moving equipment. UNDP and WFP also supported rehabilitation of salt pans after a cyclone in the late 1990s, while WHO and IGN (then ICCIDD) provided survey and laboratory support. As part of a process to develop a national strategy for IDD elimination, UNICEF and IGN investigated why achievements were under target in 2016 and 2017, and determined that electricity required to wash and dry raw salt was a major barrier and required innovative solutions. 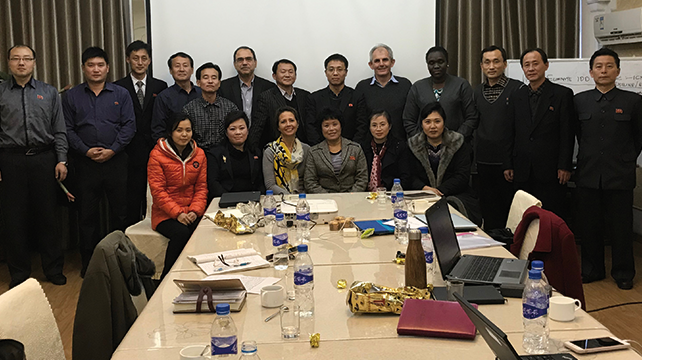 IGN’s salt industry consultant, Alister Shields visited some salt fields and factories in 2017 and held detailed and intensive discussions with stakeholders, who agreed on the new strategy to overcome this challenge, as well as address the lack of high quality raw salt in DPRK. "It will likely take some time before higher quality raw salt can be produced. In the interim, iodine will be added directly to soya bean paste and soya sauce, for sale to households. This strategy takes advantage of the government-managed food production and distribution system that is unique to DPRK and will achieve high coverage rapidly." It will likely take some time before higher quality raw salt can be produced, as it will require gradual changes to the salt pans and management of the brine in production of salt. Therefore, in the meantime a complementary, interim strategy will be employed; KIO3 will be added directly to industrially produced soya bean paste and soya sauce, for distribution to government public distribution shops for sale to households. This strategy takes advantage of the government-managed food production and distribution system that is unique to DPRK and will achieve high coverage rapidly. The conditions in DPRK offer unique constraints to the implementation of salt iodization, but they also offer unique opportunities to increase iodine intake. The revised strategy has taken these in account and there is optimism that adequately iodized salt will become more readily and consistently available in DPRK and the identified problem of iodine deficiency throughout the country will eventually be addressed. Karen Codling is the IGN Regional Coordinator for South-East Asia and the Pacific. Previously, she was Nutrition Specialist in the UNICEF Regional Office and the Thailand country office, where she first started working on salt iodization programs. Karen was the Executive Officer of the Food Fortification Initiative (FFI) Secretariat for Asia.